Reed offers a true liberal arts education. 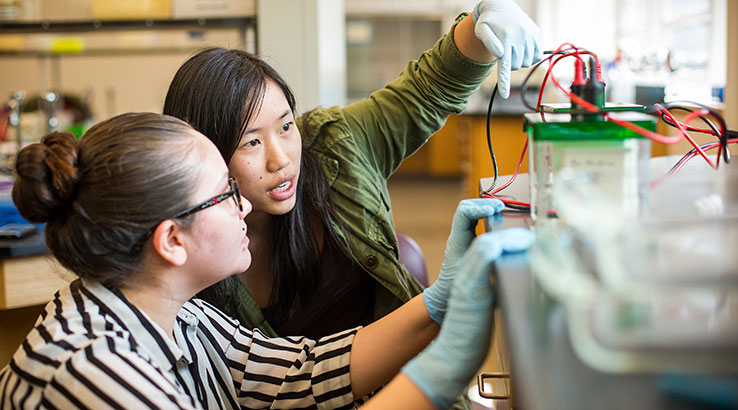 Combining a structured, classical curriculum with the cultivation of independent thinking, Reed has remained steadfast in its central commitment to foster in Reed students inquiry and discovery—the keys to a life worth living. At Reed, every course is taught by a professor, rather than by a teaching assistant, and the student-to-faculty ratio is 10:1. As the primary stewards of the curriculum, the faculty ensure that Reed develops in its students the kind of creative thought, experimentation, and critical thinking for which the liberal arts experience is known and cherished. Assignments at Reed—papers, exams, and lab exercises—are returned with extensive feedback from faculty rather than letter grades to strengthen the atmosphere of intellectual engagement and unparalleled personal attention. From the intimate setting of the Humanities 110 conference in the first year—an experience that all freshman share—you will progress through a series of academic milestones that culminates in the scholarly partnership of the senior thesis. This capstone project is the most flexible aspect of the curriculum, providing you with the opportunity to work intensively with a faculty adviser to produce a substantive, original contribution to scholarship.